This post is the second installment in a series about leveraging waste management as a means for social and economic development in Bluefields, Nicaragua. Students in MIT’s D-Lab Waste course are writing these posts from Nicaragua. This project is part of an ongoing partnership between MIT, the City of Bluefields, United Nations Development Programme, and blueEnergy. The following post includes student project descriptions in three core areas: recycling, composting, and anaerobic digestion. Our group’s focus is to collect data and develop recommendations for creating a financially sustainable recycling enterprise in Bluefields that will help improve working conditions for waste-pickers who currently work at the 19th of July Dumpsite. In doing so, we hope to further propel their ongoing efforts to organize into an independent business association. Our first task is to better understand the City’s current waste collection system so that we can help determine which attributes might lay the strongest foundation for the City’s new recycling venture. In the course taught by Libby McDonald this past fall, we learned about different components of a successful recycling business. To build one, you need to understand factors such as markets and pricing for secondary materials, types of waste processing equipment and logistical strategies to implement them, capital costs, transportation, and strategies for engaging the interests and values of potential stakeholders. Different case studies discussed during the course taught us about the importance of collaboration, the necessity of participatory planning, and the potential of socially-inclusive business models. One particularly meaningful example for this project is the ITEKE Waste Recycling Cooperative in Ivory Park, Midrand, South Africa. During our first visit to the 19th of July Dumpsite (where our most valued stakeholders, the women waste-pickers, work) we got to speak with approximately fifteen women who depend on the dump for their livelihood. When they don’t pick, they don’t eat, and neither do their families. In fact, many use their earnings to send their children to school. Despite these circumstances, the women are excited about the possibility of what a recycling enterprise might mean for their futures: more stable pay, better working conditions and means for social mobility. For more information on waste management and the urban poor, click here. Composting is a natural process that recycles organic waste into a rich soil. Earlier this semester at MIT, the composting group learned a lot about composting through a series of lectures, field trips, and a project. We teamed up with a local client to design and construct a grinder that would help both our local client as well as three women involved with composting in Bluefields. 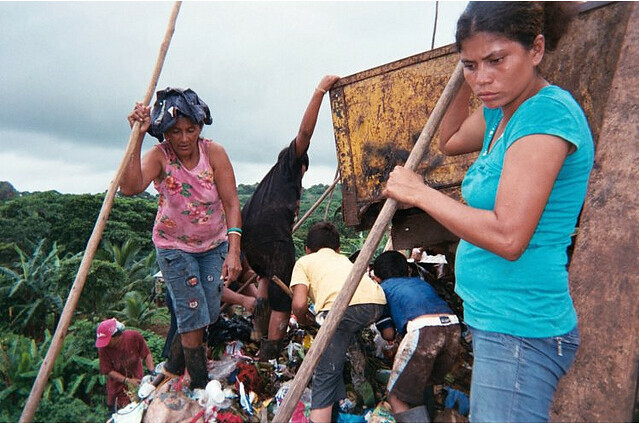 These women are paid a flat rate by the municipality (“Alcaldia”) to produce compost from organic waste. The compost is then sold at the Mayor’s office to small farms and families with local gardens. We aimed to create a product that would both speed up the initial grinding process of chopping the waste down to small bits, and reduce the physical strain from being bent over with a heavy machete chopping waste for several hours — problems that both our local client and the composting women in Bluefields seem to have in common. Now in Bluefields, however, we see a paramount problem. Although our prototype would have been helpful to the composting women, the big issue is that there is no market for some of the compost. These women only compost about ten percent of the total organic waste in Bluefields, and the mayor’s office is presently only able to sell 50-60% of that material. Our ultimate goal for these two weeks is to develop or find a viable market for the compost, while keeping the values of the composting women and the mayor’s office in mind. We anticipate looking into both local and external markets, potentially using the composting in small house-gardens, and further exploring ways to collaborate with the biodigester group on linking excess organic waste streams from the composting initiative to the proposed anaerobic digester all to ensure a sustainable composting project. The biodigester team consists of four graduate students and is highly interdisciplinary, including City Planning, Engineering, and Architecture students. This makes it easier to think systemically because our special interests complement one another. The anaerobic digestion process is simple: organic waste such as grass, food scraps, agricultural residues, or manure are mixed in a container either above or below ground. Bacteria in the digester break down organic material into simpler forms of carbon and nitrogen in the absence of oxygen to create methane and other trace substances. This methane is then collected, distributed through pipes, and burned off for various end uses, ranging from cooking fuel and heating to battery charging and electricity. The process also produces a valuable by-product called effluent, or “digestate”, which is rated as a top quality organic fertilizer that can be sold. Used throughout the world in rich and poor countries alike, anaerobic digesters are universal in application and can be built for as little as US $200 on the residential scale. Overall, the benefits of anaerobic digestion are hard to deny; it is an affordable way to deal with organic wastes and offers numerous social benefits. We partnered with two external entities – Waste Ventures for the first part of the semester and blueEnergy for the latter – and began by researching existing biodigester types through case studies on projects in China, Central America, India, Brazil, and the United States. We found that most biodigesters are implemented for one or more of these reasons: to mitigate deforestation, create alternative energy without using fossil fuels, reduce greenhouse gases, save energy costs, manage waste, and generate revenue such as this case study in Costa Rica. We also worked closely with our mentor and D-Lab Director, Victor Grau, in constructing a mini biodigester to test the technology as well as our knowledge. With the help of this semester’s lectures, field trips to various farms and tours of biodigestion, composting and recycling facilities, we ended the term feeling well-versed. We even found ourselves casually discussing this technology to our friends and colleagues. “It felt like our project was abstract before we got here and then, at the Alcaldia (municipality), we met with Gerardo (city employee). Suddenly, I realized there were real people whose jobs depended on our recommendations and that our job was to guide them toward a better understanding of the possibilities. My gut reaction was ‘who are we to tell them how to do this when many of us aren’t even fluent in Spanish?’ Then today was when I realized we could do this—when I saw the slaughterhouse and what was there. I realized we had spent a while learning about biodigesters and that, in fact, we had a lot to offer. So we’re giving it a good honest try.” – Claire M.
Wow. What an incredible set of waste ventures – so much potential and possibility. Thanks for helping me to get a clearer picture of what you are doing down there. This is such important work. This is incredible. I am very happy to see such socially minded ventures going on. In fact, I seek out this sort of information because social responsibility is a passion of mine. It’s the way of the 21st century. Thank you, MIT, for your services to the world!! Following Colab on Twitter.